Why do teachers assess English the way they do? I’ve been based in Slovenia for a few years now and regularly come across examples of how English is assessed in primary schools. I don’t know with empirical certainty how typical what I see is but I’m tempted to believe that it is simply because the same kinds of test items and approaches to marking keep on appearing. Here’s one example. In it’s favour, the exercise uses a visual to stimulate a response. But what’s frustrating is the severity with which it is marked; numbers 2 and 3 were awarded 0 marks because of spelling mistakes while, if we accept one/a as possible alternatives, the half mark deducted on the final item also seems severe. The fifth item also received 0, but this is justified given the grammar and spelling mistakes. My overall reaction to this example is that the marking is excessively harsh. It’s useful for students to know the names of cities and countries in English. But this exercise is as much a test of general knowledge as it is of English. And again, while the student left a) and d) blank (the teacher filled these in while marking), the teacher’s decision not to award anything for b (‘Japan’) is harsh. This exercise required students to complete the sentences with a possessive adjective. I’m interested in items b, f and g. These were all marked wrong but one can imagine contexts where they would be meaningful and are not technically grammatically incorrect. The problem here is poor test design (lack of clear context) and the teacher not considering anything beyond the obvious answers. Why do teachers test their students in this way? Is it because they genuinely believe that accuracy and explicit grammatical knowledge are what primary students need most? What levels of assessment literacy do primary school teachers of English have? The British Council’s Teacher Assessment Literacy project may be useful here, including the video on assessing young learners. What other factors shape teachers’ assessment practices? (for a list, see an earlier blog on teaching grammar)? 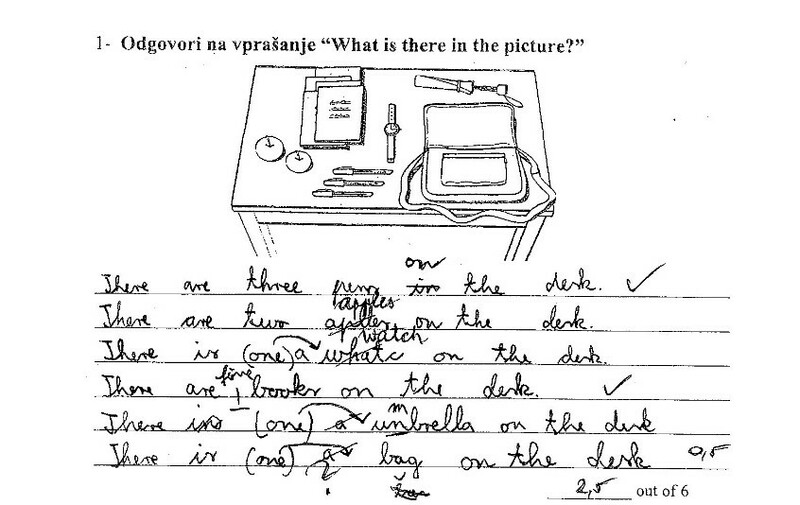 How common are the above approaches to the classroom testing of English in Slovenia and in primary schools elsewhere? How can teachers be encouraged to reflect on and review such practices? It would be great to hear what primary school teachers of English in Slovenia think and to hear about experiences elsewhere too. This entry was posted in grammar, professional development and tagged English for young learners, primary school, Slovenia, teaching grammar. Bookmark the permalink. 5 Responses to Why do teachers assess English the way they do? I do agree with the comments you made on the discrete item tests. Context is what gives the words n sentences meaning. Yes, the marking was harsh in the samples shown. I think language teaches have to consider the context in which the words/sentences are used. Thanks for sharing the experience in Slovenia. Thanks Bernadette. Which context do you work in and how are children learning English assessed there? Thanks for sharing your thoughts on tjisnissue. I can see the same focus in primary school testing in my country and it is so ingrained, it will be difficult to change. Hello Marina. Which country do you work in? Are teachers of English given any support to help them assess children there? I’m sorry because I’m not A (ei) ‘native English teacher’, but the criteria (? I don’t know this is the right word here) of your second example is strange. The way of judging the answer is different from the other ones, other questions, a), c), d) and e). (Though this my English expression is also strange). ブレがある。The method of assessment is not straight. Sorry for my poor English. In my opinion, the second example of assessment is very strange.